Allisa A. Meade of McKinsey didn’t stop there in saying the markets are going to be upended. She told the meeting of America’s Health Insurance Plans in Chicago on Thursday that the health law also will create a subset of 30 to 40 million people who could be called an ?outlaw market? of Americans who choose not to buy coverage and to pay a tax penalty instead. According to Congressional Quarterly, ?Meade said that population is likely to be healthier and wealthier than other Americans and that it might offer an economic opportunity to plans to sell low-cost products. McKinsey also predicts many employers will drop coverage because it will make more economic sense to pay a penalty that is lower than the cost of providing coverage. Depending upon how many do, the individual market for health insurance could grow by up to 300 percent. Whatever actually happens, Meade said companies in essence must start from scratch in their individual insurance divisions because that market will change so dramatically. sent in last Tuesday?s election. Over and over, they say that health care really wasn?t that much of an issue. Soon-to-be-ex-Speaker Nancy Pelosi says that voters are just mad because they don?t have jobs. told FOX News: ?The economy, as important as it was, was not the decisive factor this election. Health care was,? he said. they want it repealed, and this issue is gonna go on and on.? preparing measures that delay, defund, and begin to dismantle the legislation. those already in office, will become valuable allies as the march toward repeal unfolds. will be showcasing the worse of these regulations and working to stop them. real problems in our health care sector. model could meet the test for a federally-approved exchange. menu of plans they will offer. led by Florida, challenging the constitutionality of the health overhaul law. legislative branch also has serious, serious problems with the law. will love this. What a great country this is! What Does a Republican House Mean for Health Care Reform? 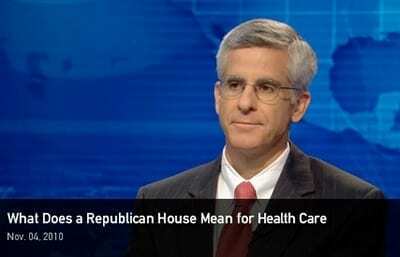 In this NewsHour video, Jim Capretta and others discuss the recent election and health reform, and the possibility of repealing the health law. 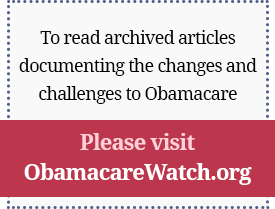 Should States Establish Obamacare Insurance Exchanges? Avastin vs Lucentis: One Step Closer to Cost Rationing?